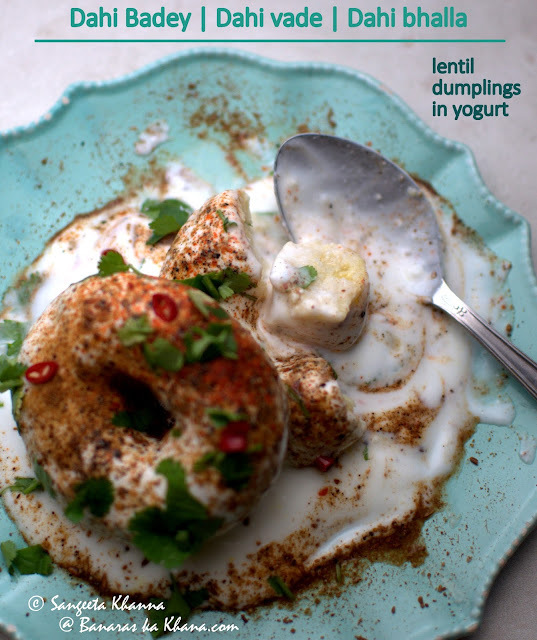 These dahi bhalle I made for holi but could not post it then, so it comes now and I am tempted to make them again. These are really soft and flavorful vadas with melts in your mouth texture that comes with a bit of practice. Normally I make them plain but this holi I wanted them the way my dadi used to make. With a flavoring of black cardamom and ginger. All of us remembered her while eating these dahi vadas with a ginger and black cardamom flavor.. Some people find it hard to make soft and melt in the mouth type vadas but the trick lies in making the vada paste a little finer and lighter (by giving it an extra whiz in the grinder). After that the fried vadas should be soaked in hot salted water until they double in size, they become really soft after this. Drain them, top them with curds n masala and serve. There are a few things that one must take care of when trying to make soft dahi badas. Soak the urad dal for 3-4 hours minimum. Grind the daal along with a little water to make a very smooth paste that looks like whipped cream. You need to run the blender for extra couple of minutes to whip the paste till light and airy. To test the airy nature of the urad dal paste, take a spoon full of paste and drop it in a deep bowl of water. The blob of urad paste should float on the surface. Fry the vadas on low flame so it cooks evenly. Soak the fried vadas in salted hot water for at least 30 minutes so it soaks the water and gets really soft. The fried vadas can be refrigerated for a week or so and soaked in hot water for a little longer time whenever required. Soak the daal overnight and grind to make a smooth paste, water has to be added during grinding and the consistency should be soft but not runny, air should be incorporated into the batter by whizzing it again into the blender. Heat oil in a deep frying pan and shape the vadas with a wet hand, just take a handful, smooth it on your four fingers, with your thumb make a hole in the center and drop carefully into the hot oil, 3-4 vadas can be fried in one batch and it has to be done on medium flame so that it gets cooked through. When the vadas get golden brown in the hot oil, drain from the oil and dip into salted boiling water right away. Repeat frying more batches of vadas and keep immersing them all into salted boiling water. Let the vadas be fully submerged in hot water for about an hour or till they all double in size. At the time of serving, sprinkle the masala in whatever proportion you like and enjoy soft dahi vadas. The vadas are crisp just after frying, after soaking in salted hot water it becomes doubled in size and quite soft. The curd should be beaten smooth and some sugar can be added to it if you like it khatta- meetha. Sweet sonth wali chutney can be used as a topping too to make it khatta meetha....this one is a plain slightly khatta vada which goes well like a side dish or like a chaat snack. The topping I used this time is some bhuna jeera, red chilly powder and black salt. I shall post other variants as and when I make them..
double in size after soaking in hot water :-P mera toh zara bhi nahin badha...and the vadas after frying look quite white.... is it due to light or they are supposed to be like that??? 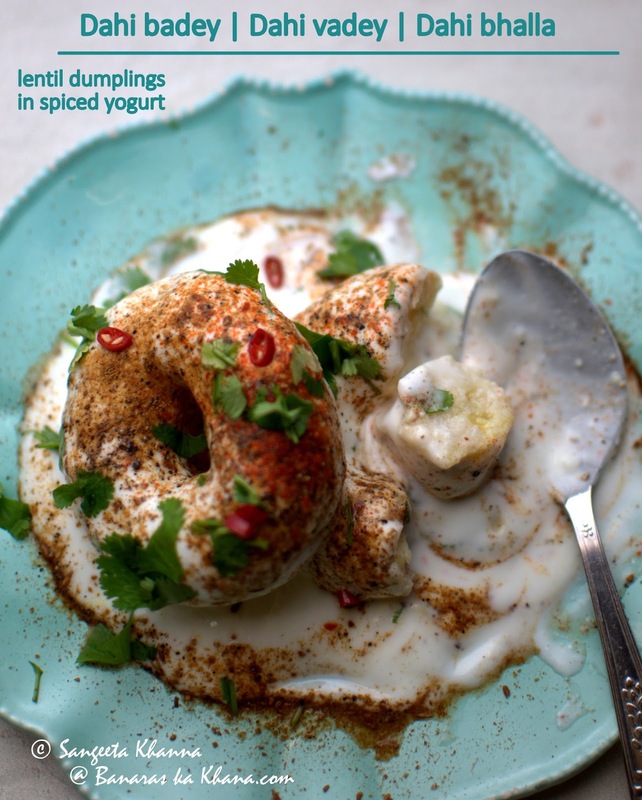 I loved this recipe for Dahi Vade with the Ginger and black cardamom addition. I want to try it out but am wondering about the black cardamom. I have never ground badi elaichi, they are quiet hard, can I powder them separately, crush ginger separately and add all that to the batter?. Does badi elaichi needs to be fine powdered or a semi fine coarse one will do?. Also do you know of any other variation of dahi vade where there is some sort of stuffing inside the vade?. I had dahi vade made by my friends very sweet great grandmom long time back and I wish I could reproduce that one, I don't remember what was the taste like, maybe raisins + sonf or something..not sure at all but they were amazing. Thanks, so much. -Neha. Hi Neha, the badi elaichi and ginger can be ground separately and added to dahi vada batter or can be ground together with the urad daal to make the batter. Thank you Sangeeta, will give this recipe a try this Saturday. I also emailed you about Detox plan on your Gmail account. Will give you an update on the outcome..thank you! - Neha. Hi Neha, my gmail id is sangeetaamkhanna@gmail.com. Probably you mailed at a wrong id as I didn't get any mail from you. I made them!. With Ginger and Badi elaichi and they were so good. I loved the earthy flavor badi elaichi gave. I also did the filling ones too, just a few and they are good too. I guess you can't go wrong with properly made Dahi vade,plain or jazzed up. Thank you for wonderful recipe and clarifications. -Neha. That's great Neha. So glad the dahi vada worked for your palate.